Puntos Necesarios: 1400 Tenga en cuenta que, de momento, no se puede descargar contenido de nuestra plataforma directamente en un dispositivo móvil (teléfono, iPod, iPad, tabletas ...). Necesitas descargar sus artículos en un PC o Mac y, a continuación, transferirlos a su dispositivo de forma normal. Estamos trabajando para permitir que las descargas directas a los dispositivos móviles, pero esto no es posible en la versión actual de la plataforma. Perdón por las molestias! 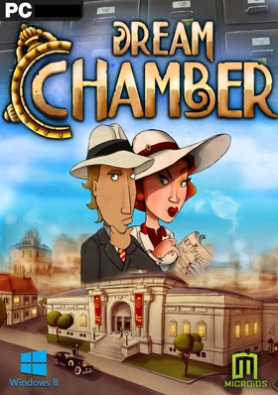 ABOUT THE GAMEA humorous adventure with a quirky cartoon graphic styleImmerse yourself in 30s America, between Prohibition and the Great Depression, and discover Charlie, a rich heir who divides his time between social obligations and his hobby as a private detective.During yet another official museum opening, Charlie witnesses a robbery, the victim of which is none other than his own girlfriend. … Firmly set on investigating the case despite the reluctance of his uncle, the detective in charge of the inquiry, he unknowingly embarks on what will become the greatest adventure of his life!Thanks to his unique skill and unrivalled memory, Charlie explores and investigates all the way into his dreams! In true adventure game style, Dream Chamber will delight the genre’s fans and captivate new players!KEY FEATURES A unique graphic style! An original game with a brand new scenario Revisit your investigation scenes in your sleep – you might find the answers in your dreams! Solve many different enigmas and puzzles Interrogate the suspects and break their alibis via mini-games A jazzy and humorous atmosphere Voices in English and texts in French, German, Italian and Spanish SYSTEM REQUIREMENTS PC: OS: Windows® XP/Vista/Seven/8 Processor: Dual Core 2 Ghz Memory: 2 GB Graphics: 1 GB Directx 9.0C / OpenGL 2.0MAC: OS: Mac OS X 10.5 or later.